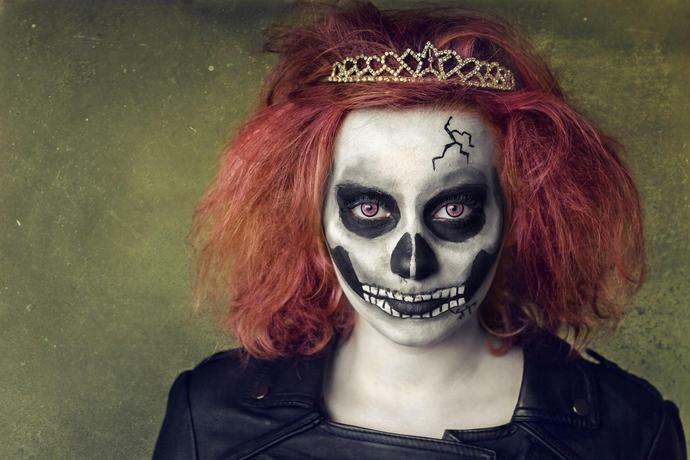 Thanks to some seriously creative makeup artists, you can produce an entire Halloween costume out of makeup alone. Creating a flawlessly freaky look with face paint doesn't have to be scary - there are tons of easy Halloween makeup tutorials out there. What is scary? The aftermath of caking on all that heavy-duty makeup. "Heavy makeup, particularly with silicone, dimethicone, and waxes, can clog pores and increase breakouts," Lily Talakoub, a board-certified dermatologist in McLean, Virginia, tells Allure. We asked the pros how to prevent waking up to a complexion nightmare on November 1. A few years ago, your only real option for a killer Halloween makeup palette was to invest in some professional theatre-level makeup or go for the cheap options at the Halloween store. The latter, often turn out to be nightmarish for your skin. "Some of the cheaper options contain more harmful ingredients such as heavy metals, formaldehyde or formaldehyde releasers, and petrolatum that may not fully refined and contaminated with polycyclic aromatic hydrocarbons (PAHs)," Sejal Shah, a board-certified dermatologist in New York City tells, Allure. Before you buy anything, check the labels for comedogenic ingredients (like, acetylated lanolin, D&C red and octyl stearate) and occlusive ingredients, which "can trap comedogenic ingredients or sweat, oils, and other debris on the skin and clog pores," Shah says. Examples of occlusive ingredients that can cause acne are waxes, petroleum, and mineral oil. You also want to avoid products with silicone, dimethicone, and talc, Talakoub adds. A good rule of thumb for All Hallows Eve (and every night, TBH) is to upgrade. "Better-quality makeup is better for your skin," Talakoub says. Luckily, there are tons of richly pigmented, high-quality, bone-chillingly good (and affordable!) Halloween beauty collections. Translation? Products for fantastical looks that won't wreck your skin. Before starting your total makeup transformation, use a gentle cleanser to remove any oils from your skin, Talakoub says. Then prep your skin with a light, non-silicone-based primer. If you are using lower-quality makeup products that might be irritating (glitter can sometimes be an irritant, Shah says), or using prosthetics, you might want to consider prepping skin with a professional-grade barrier cream. "The difference between this and regular primer is that this is actually sealing off your skin, so that the makeup you put on top of it can't be absorbed," makeup artist Ashleigh Ciucci, tells Allure. The other difference is that you're not going to find this at your local Walgreens, since it's only carried by professional-makeup suppliers. Ciucci suggests Alcone Barrier Cream. The real skin-saving magic happens when you wash your Halloween makeup off. "When using heavy makeup, I recommend a double cleanse," says Shah. "If the makeup is oil-based, generally an oil-based cleanser will work better to remove it." She recommends Boscia MakeUp-BreakUp Cool Cleansing Oil, IT Cosmetics Bye Bye Makeup Melting Cleansing Balm, and Albolene Moisturizing Cleanser. After cleansing, follow with by soaking a cotton pad in micellar water and swiping over skin to get any last bits of remaining makeup. If you really caked it on, you might want follow that with a light exfoliation, Talakoub adds. "When the makeup is completely wiped off, use a light exfoliant with 10 percent glycolic acid like Cane + Austin 10% Retexture Pads." Now you're ready to paint away without waking up with skin that's scarier than your American Horror Story costume the night before.